Here’s Why Marketing with Custom Reusable Bags Works! 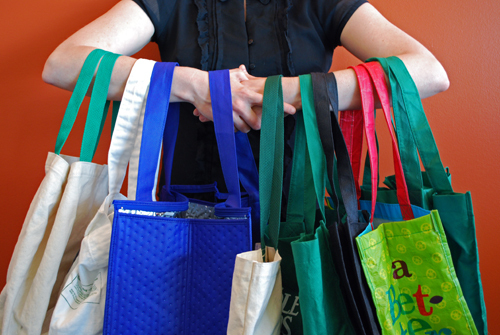 There are a lot of traits that make custom reusable bags a great marketing tool. From their eco-friendly impact on our planet, to their great value and effectiveness at getting the word out about your brand, there has never been a better time to market with custom reusable bags. We’ve rounded up 5 reasons why you should consider creating a custom reusable bag for your brand. Promote Your Brand. The most fundamental purpose of a promotional item is to promote your brand. Custom logo’d reusable bags are effective tools to establish and maintain your brand’s recognition. When you customize a reusable bag with your corporate colors, logo and other branding information your customers will think of your brand every time they reach for it. When your customers carry your bag they will essentially be carrying a sign and promote your products or services to everyone they encounter. The act of carrying and using your custom branded reusable bag also serves as an endorsement, so when your customer’s family, friends and coworkers see your bag they will have a positive association with your brand. Reduce Your Company’s Carbon Footprint. When you create promotional bags from recycled or sustainable materials you are minimizing your brand’s carbon footprint and preventing the use of disposable bags. Sustainable materials like cotton, bamboo and jute are plant based textiles. They are green because as they grow they convert greenhouse gases into breathable oxygen. Once harvested and processed into material and eventually reusable bags they have no ill impact on the planet. Once they have fulfilled their usefulness as reusable bags they can be recycled or even composted. Recycled materials make great promotional items because they give a new purpose to items, like plastic bottles, that otherwise may be carted off to a landfill or end up as litter. Walk the Walk. If your company has clearly stated green goals it is important to make sure everything you do as a company is in line with these goals. Making green choices isn’t always easy, but creating an eco-friendly promotional item is an easy way to show your customers that your company is serious about helping the planet. Showing others that you market your brand while staying true to your green initiatives can inspire your customers and vendors to make similar choices in their personal or professional lives. Get the Most Bang for Your Marketing Buck. Clearly, you want to get a great value and make the most out of your marketing budget. At Factory Direct Promos we work closely with our factory. There are no middle men adding markups, so our reusable products come with a low, budget-friendly price. We also pride ourselves on creating durable, well-made reusable bags that will hang in there for years of dependable use. Each bag wears differently and ultimately how often your customers use your branded bag and how well they care for it will determine how long the reusable bag lasts. On average our reusable bags deliver 3 – 6 years of use. That means this investment will be paying dividends several years from now. Create a Must-Have Marketing Tool. Reusable bags are really versatile. Oftentimes they are used to carry groceries home from the store, but they also make handy lunch totes or gym bags, or they can used to carry just about anything anywhere. For all of these reasons reusable bags make popular promotional items. When given out at a tradeshow or other event, people will often show up just to get a reusable bag. Ideally, you want to get your custom branded gear into your customer’s hands to serve as a reminder of your company and a token of appreciation for their support. There is still value in giving your branded bags to people who are not customers, because they may become customers and they will still spread the word about your brand when they carry your customized bag. Why do you promote your company with custom reusable bags? Did we miss anything? From the positive eco impact and effectiveness at getting your message seen custom reusable bags can do a lot for your brand. Let us know if you have questions about the process or any of our bags, or if you’d like a quote for custom reusable bags for your brand! Previous Previous post: Plastic and Paper are Out and Reusable Shopping Bags are In for Marketing! Next Next post: How Much Plastic Is Really In Our Oceans? Latest News on Bag Bans in the U.S.